Your thoughts on advancing straight to Code S? I was so sorry to my fans about falling down to Code A. I am glad to have made it back in. How much have you recovered so far? I think I’m feeling a lot better. Not entirely but it’s definitely better. I reviewed my Code S matches today and they were rather bad. Compared to then, I’m playing much better right now. I prepared nothing in particular. All Terrans play in a similar manner so today’s match looked just like practice. Lately, there was a patch that affected Zerg. It’s definitely become easier since the patch. I’m not too happy with it though. The patch helped all Zergs. I was already good before the patch but now there’s no advantage for high level players like me. ZvT has become easier since the patch. How does it feel to have played all the way from Code A Round 1? The waiting time for Code A matches is so long and you get less attention so I wanted to get back into Code S quickly. I’m not really interested since I’m not in it and neither is a Zerg. I do want to get back on the stage of the finals. Are you confident about making the finals of next season? If I keep up my current performance and practise consistently then I won’t be eliminated so helplessly from Code S like this season. Any desire to take on the champion in ro32? I don’t care. They’re both great players so either one will give me a good match. I guess I’ll receive a lot of attention if I take on the champion. You had a lot of foreign events lately. I attended an event match in Taiwan recently and it’s good to have something to do. Anything’s better than doing nothing. So how was the event match in Taiwan? I visited because of a sponsor and I took the opportunity to attend the event match. The Taiwanese fans were really happy. They made the event great for me. I want to thank the coach, his family, my family and players who practised with me: Dream, Keen, Sc, Noblesse. Since I’m back in Code S now, I’ll take good care of myself and play some great matches. Today is a special day for a special someone so I want to say thanks for staying by my side and ask that he/she continues to be my pillar of strength (T/N: must be his girlfriend he’s talking about). Your thoughts on your return to Code S? I thought I wouldn’t be able to since it was a PvZ so it’s a relief. I’ve stayed in Code S all the time except for one season so I realised the importance of Code S during my stay in Code A. As a result, I worked really hard for this match. Weirdly, I always feel metagame changes before anyone else. Since I’m having trouble in PvZ right now, soon, other Protosses will start having difficulties against Zerg. At the moment, 6 out 7 players at the top of the ladder are Zerg players. That’s how good Zerg is. Since we have many Zergs in Round 3 of Code A, next season will see a lot of Zergs in Code S.
I don’t enjoy using the mothership. It just doesn’t appeal to me. Even if I had made a mothership in Set 1, I still would have lost. Weren’t you worried about losing after dropping Set 1? I was worried even before arriving at the studio. Zerg is in such a good spot at the moment. Well, I guess there’s always a silver lining and I managed to survive somehow with the immortal all-in build. People say that Protoss is doing really well but do you think that Protoss is soon to be on a decline? Protoss will become weak again in the next season. In PvT, the better player will continue to win but Protoss is having way too much trouble against Zerg. Protoss has the worst scouting capabilities out of the three races and Zerg has had its own scouting reinforced. It’s so hard for Protoss. After taking second place last season, you were eliminated in ro16. As a progamer, I should have at least one trophy. I think luck will have to be on my side for me to win one though. 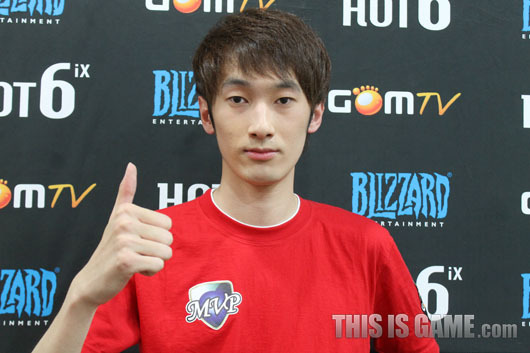 DRG switched to Zerg after initially choosing Protoss and he really made the best choice possible. If he had stayed with Protoss, he wouldn’t have even gotten through the qualifiers (laugh). 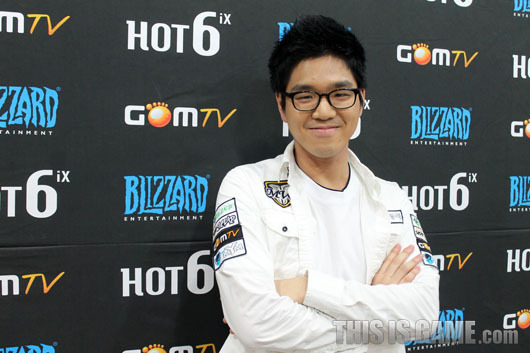 Do you want to face DRG once again in Code S? I want to face him but the only strategies that Protoss has against Zerg are all-ins. So, no. I was hoping that there would be few Zergs next season but a lot will advance from Code A. The first time I got through the qualifiers, I got eliminated in Round 1. That defeat helped me get into Code S today. It made sure that I played with all I had. Nothing’s changed particularly. I just play like I usually do in practice but it seems to be working. I do feel myself growing as a player as a result of my hard work. Your opponent is a former GSL champion but you didn’t seem nervous at all. If there’s something special about me, it’s that I don’t get nervous in broadcasted matches. Lately, I don’t get nervous at all and even concentrate harder than in practice. It happened the first time I got through the qualifiers. 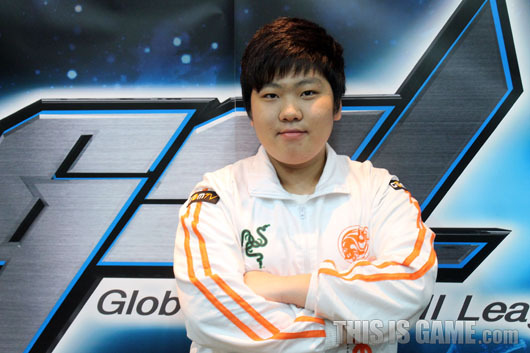 Then, as I played in GSTL, I became comfortable in broadcasted matches. I don’t have a particular style. Sticking to one means you get figured out. The baneling strategy I used today was recommended to me by my teammates. It had a good win rate in practice so I utilised it against jjakji. Did the recent patch help? It was a ton of help. The increase in queen’s ground attack range meant that I could delay spine crawlers. Scouting was easier which means I could play the game comfortably. Your goal for next season? My goal so far has been to get into Code S. Since I achieved that today, I guess I need to think of a new one. It might be too big for me right now but I think I will aim for a championship. Anyone you want to face in ro32? If possible, I want to take on Genius. However, since Genius isn’t a seed holder so such a match probably won’t come to fruition. They weren’t able to accompany me today but I want to thank my coach and teammates who are cheering me on from the training house. Yesterday, the coach’s wife coocked “Gam Ja Tang” (T/N: potate and meat soup kinda thing) for me so I want to say thanks. I will continue to work hard so I hope more people cheer me on. Your thoughts on getting into Code S over aLive? He’s a close friend of mine so it’s regrettable it has to be this way but I am happy to be back in Code S. I feel good since I think we had an interesting match. You used 6 pool in Set 1. Lately, Terrans haven’t been walling off which peeved me off so I tried it out. I was going for a specific timing as I found out that alive walls off late from watching his VODs. That’s why I used that build. No special reason. The first two maps were very difficult so it seemed like I needed to take a risk to win. That’s why I went for an all-in build. How does it feel to make the 6 pool work after 2 years? Team captain “Lee Jun Ho” jokingly told me before the match to make it quick with a 6 pool and a 11-11 two rax so I felt a bit taken aback during the series. I am an expert with the 6 pool strategy. I hope Terrans stay on their toes since I might pull it out anytime. You lost to a 11-11 even after scouting it in Set 2. I found it so funny. I needed to send my lings out much earlier but wasn’t able to because I was laughing so hard (laugh). This is your fifth time in Code S in a row. It’s time for a championship. I will work hard to make that a reality. Before the match, I was joking about it with Jjakji but inside, I really wanted it. I still regret taking second place. The championship no matter what. So first of all, getting to the finals. I want to thank FXOBoss and Lucky is the new captain which makes me happy since he’s a fellow Zerg and I hope he leads the team well. Zergs haven’t had much say in the team so far so I hope Lucky fixes that (laugh). FXOSupreme entered the house yesterday so our Zerg line up is better but it’s still not enough. Lucky has a big role to play. How are you so fast, seriously <3 you dude, thanks for the translation! No talk about the pause controversy? Maybe he deliberately attacked into that choke to even things up, though that's not very DRGish. 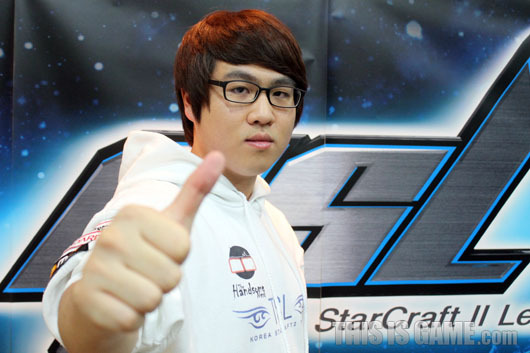 ooh awesome more zergs in gsl plz! well, i want a million dollars. trade? Haha genius with Z>>P. Let zerg whine commence! (I actually have missed it what with the terran tantrums of late). DRG doesn't need no stinking patch. Nice interviews, I am curious what brought about the this mentality of PvZ in Genius. Last season it seemed to me like he had the meta game figured out and was unstoppable, beating everyone on his way to the finals (even DRG), before falling in the final in what seemed to be mostly a series where his own decision making was at fault. This season Protoss have done very well, although they didn't have that many zergs to face. I wonder if Genius really thinks this patch represents such a strong buff for zerg, or it is something else he has noticed. All interviews now up. Feel free to PM the location of the million dollars. thanks as always man :D sydneysiders unite! haha silly leenock "was laughing too hard in set 2 to hold off 11-11"
thank you storywriter, I hope TL gives you your translator's avatar soon!